2 front panel knobs are all that’s needed for setting frequency on the Violet Ray Crystal Resonator. ALL calibrated and marked frequency settings are within 2% of their specified value. The average accuracy for setting frequency is approximately .4% or less. When set to the Love or Heart Chakra Frequency, the VRCR does emit a slightly audible 250.56 Hz tone that is the AMT Coil vibrating in high energy resonance. The reason this setting is the most audible is because the AMT Coil is specifically designed to output its highest energy at that frequency. This setting is used by the Violet Ray Bulb in assistance to healing of physical pains and ailments. The sound the VRCR produces at this one setting may disturb some people during meditation. If you find yourself to be extremely sensitive to sound, simply place the VRCR in an out of the way location where you cannot hear it as much or choose most any other setting that is non-audible. All settings are very effective. Setting Frequency for any function of the VRCR is easy. 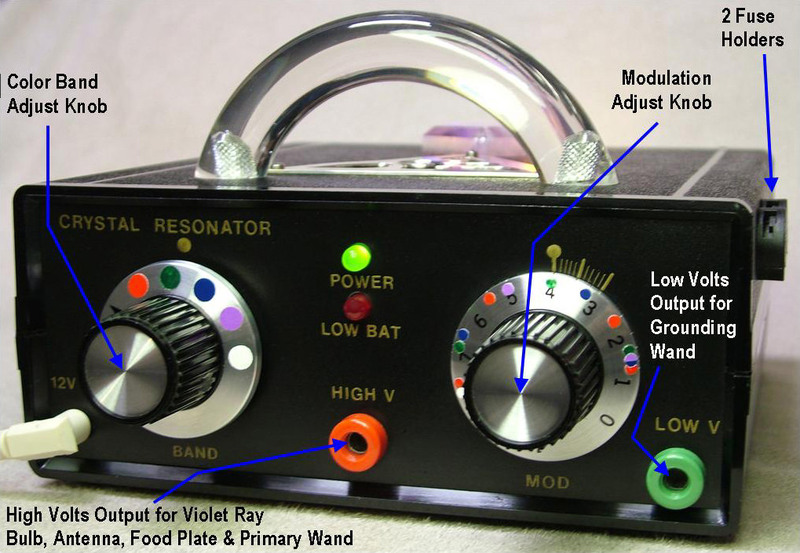 The knob on the LEFT is the COLOR BAND ADJUST KNOB – (It is the COARSE adjustment) – Setting this knob to a particular color, for example Violet, means that you must also set the Mod Adjust Knob on the right to one of the matching Violet color dot settings to be a valid and calibrated frequency. The knob on the RIGHT is the (MOD) MODULATION ADJUST KNOB – (It is the FINE adjustment) -Whatever color dot you set to on this knob means that the Left knob must also be on the SAME COLOR. Set the left ‘Color Band Adjust knob’ to the Violet Dot. On the right ‘Mod Adjust knob’, find the Violet Dot that is closest to the ‘5’ on the knob. Align that Violet dot to the gold ‘Zero’ Marker Line (with the circle on it) printed on the front panel. If the number you were to dial in was Red-2.4, what you would see is that the Red dot closest to the ‘2’ on the knob should align with the ‘Zero’ Marker Line on the front panel while the hatch mark directly above the ‘2’ on the knob itself would line up with the fourth line from the left on the front panel. Thus, representing 2.4. Each fine mark on the front panel represents a (.1) increment. Set the left Color Band Adjust knob to the Green Dot. On the right Mod Adjust knob, find the Green Dot that is closest to the ‘6’ on the knob. Align that Green Dot on the knob to the gold ‘Zero’ Marker Line on the front panel. What you will see is that the Green Dot closest to the ‘6’ on the knob aligns with the ‘Zero’ Marker Line while the hatch mark directly above the ‘6’ on the knob would line up with the ninth line from the left on the front panel. Thus, representing 6.9. Once you become familiar with where the color dots are and what chakra they represent, you don’t have to pay attention to the numbers. Just dial into the desired color dot position. If you’re tuning chakras and working downward, you would start at the highest set WHITE dot. Then move onto the next lower WHITE dot. And finally onto the lowest set WHITE dot. Then change to the VIOLET dots and do the same. And then on to the BLUE dots and so forth. If you see color dot markers on the right ‘Mod Adjust Knob’ that are very close to each other, simply carefully dial into the hatch mark directly above the desired dot marker. Two side-by-side Half-dot markers under one Hatch Mark means that they have the same setting. No need to be OVERLY concerned about the manual knob positioning accuracy. If your’e using a magnifying glass to make settings, that might be a bit too much perfectionism. Smiles. Chakra Balancing frequency is not that critical. You don’t need the “perfect” frequency. Your Chakras will resonate similarly and move into proper resonance.